Our log home has been standing for eleven years now and it really needed some help. The stain on the east and west sides had faded and the logs had turned gray underneath. There were also bad checks (cracks), some of which faced upward, letting the rain enter the log. Not good! Last fall, we tried sanding the logs; that left ugly “spotted” logs and it was nearly impossible to get in around the corners of the log corners. Luckily for us, David has been working for Voyageur Log Homes for over a year now and has become an expert at caring for log homes. 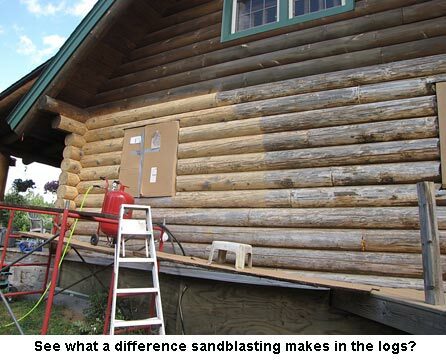 When he got back from a big job in North Dakota, he wanted to get right at cleaning, re-staining, and caulking the logs on our house. So we lined up a pressure washer and sandblaster. (Lucky for us, we have good friends who had both!) My son, Bill, also came up for our weekend job to help. God gave us a perfect day for the work, too; plenty of sun and a nice breeze. We first pressure-washed the east wall which had no checks and just some faded stain. It’s log siding so it doesn’t tend to check as bad as full logs do. I just need to re-stain it with two coats of stain and a sealing coat. It took about an hour to cover the windows on the west side of the house with plastic and cardboard and mask the drip edge below the logs with duct tape. 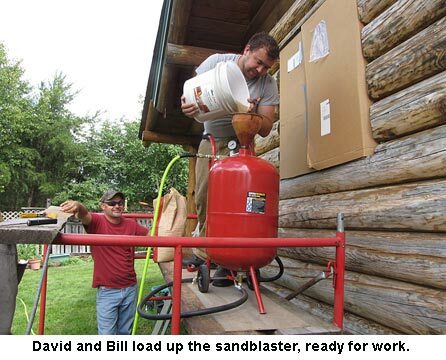 Then David hooked up the sandblaster and the work got under way. I’ll admit David looked like a creature from outer space with his hood, long sleeves and welding gloves! I’d love to meet you too. So if you ever get to a show or Minnesota, please stop by and say hi! Yuck! Slugs! They love dampness so having a raised bed will help. Some. With so many, I’d sprinkle the product Slug-go both in and around the bed. It’s poisonous to slugs but only breaks down to a natural fertilizer; won’t hurt you. As for the moss, I’d try to dig up as much as you can by hand to keep it at bay. You probably should do a pH test on your bed’s soil. It may be quite acidic which moss loves. If so, you can work in some powdered limestone which will not only discourage moss but also help your asparagus grow fatter. We miss you too! Especially when we’re doing a big project. You were so much help when we built the storage barn!!! We feel so lucky to have so many wonderful adult children. I feel really blessed to have my three guys who are not only so handy but willing to help get things done. 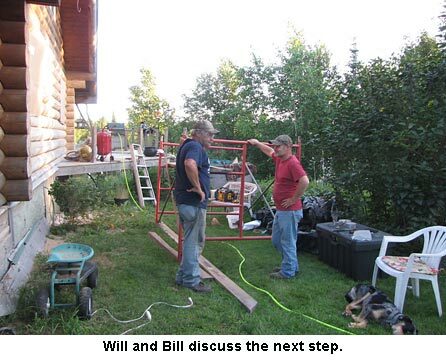 Both David and Bill chose trade schooling. Bill, an automotive diagnostic technician and David masonry. (He was called while still in school, by Voyageur Log Homes to see if he’d consider coming to work for them!) We don’t ask David and Bill to help very often as both of them are busy with their own lives and projects. But, as you can see, when we need help, they are there. You’re right; there are always jobs for folks who know how to build or fix things! I don’t know of a house out there that doesn’t require some work now and then. From brick to log. I enjoyed reading this post. I just finished reading your book “Starting Over” for about the 3rd time. It has been so inspiring to see how your homestead has evolved. You’re an amazing lady. You will never know how many people you have inspired and helped. My bucket list is to someday meet you at a preparedness seminar or something. I’m having a problem with my asparagus no matter what I try I’m getting slugs. I went so far as to wrap my raised bed planter with many wraps of copper wire. I’m also getting a low thick ground covering like a moss. I know any of the moss out will destroy my plants. And suggestions. BTW the house looks nice tell David and my Dad looks good. Love you and miss you guys. Yes it’s your far north Alaska son. Jackie, how fortunate you are to have three men in the family with these skills. There is always a need and a place for those with good construction and trades skills. David made a wise choice when he signed on with Voyageur as the skills he is learning will help him a lot. Back when I was in school, we were expected to go to University and get a professional career. A lot of those folks are laid off and working outside of their trained field. One of my nephews is in his teens and my sister is determined to steer him towards a trade profession. There is always need for those skills. They are helpful for personal use and one can always find work either with a company or self-employed. You have great sons, Jackie, to help you with all that work. Looks like it’s going to turn out lovely. 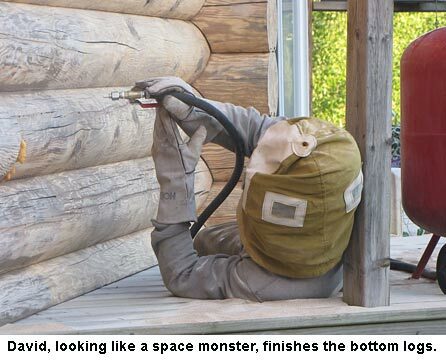 Now I can stop having cabin envy, knowing how much upkeep is in involved!